The purpose of the Embrace Life Ministry is to advance the teachings of Jesus Christ and His Church and to acknowledge Saint Pope John Paul II’s call to bring about a culture of life and civilization of love, thus recognizing and promoting the dignity and sanctity of human life at all stages. Through the intercession of Saint Gianna Beretta Molla, this group conducts and supports activities that uphold and follow all the teachings of the Catholic Church. The Embrace Life Ministry meets from 7 - 8 p.m. on the first Tuesday of each month. Our Lady of Guadalupe, “Patroness of the Unborn," is depicted carrying the Christ child within her womb. She exhibits the profound joy brought about by an absolute confidence in God – an assurance that through God, we receive the grace and strength to rise above any seemingly insurmountable situation. 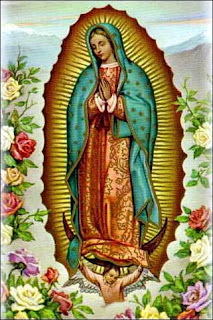 Sign up to pray at home: Parishioners are invited to participate by volunteering to accept the parish&apos;s statue of Our Lady of Guadalupe, Patroness of the Americas and Protectress of the Unborn, for one month. The statue, along with a bag containing other devotional items, will be presented at the end of a Mass to be taken home to inspire prayers for a greater respect of human life from natural conception to natural death. Choose a month! O God, our Creator, all life is in your hands from conception until death. Help us to cherish our children and to reverence the awesome privilege of our share in creation. Bless all those who defend the rights of the unborn, the handicapped and the aged. Enlighten and be merciful toward those who fail to love, and give them peace.